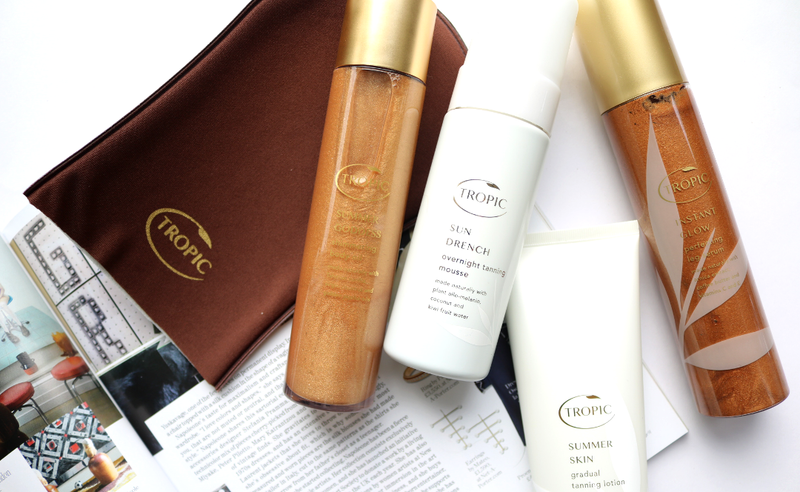 One way to blast those post-holiday blues is by keeping your summer tan looking its best for longer, so get your glow on and become a golden goddess with these easy-to-use luxury products from Tropic! Summer Goddess is an award-winning body oil that looks absolutely mesmerizing in the bottle, and equally as stunning on the skin. Its rich and nourishing base of Organic Jojoba Oil, Grapeseed Oil, Sweet Almond Oil and Virgin Organic Coconut Oil, is not only great for dry skin, but it's infused with an incredible shimmer that gives an instant golden glow to legs, arms, shoulders and the décolletage. Easy to apply and quickly absorbed without any sticky or greasiness, this is one of those products that you can use all year round for any special occasion or nights out with the girls. Oh, and it smells amazing thanks to the added Tahitian and Bourbon Vanilla extracts. 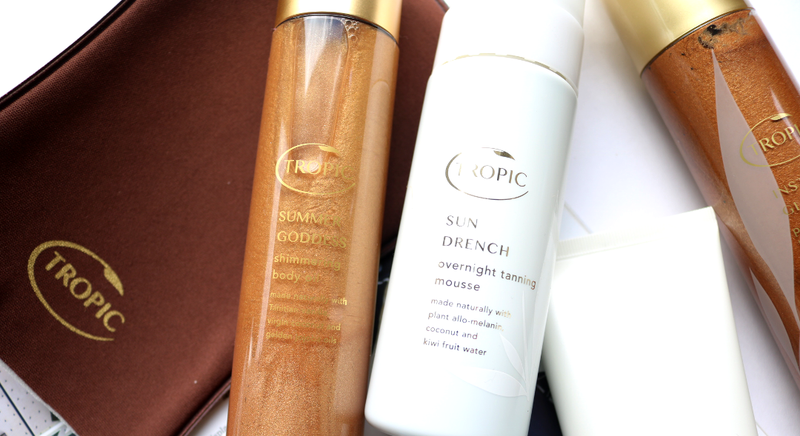 If you're looking for a tanning product that's much more natural ingredients-wise than those that are available in your local Boots or Superdrug, Tropic's Sun Drench Overnight Tanning Mousse is a lovely one to try. It features Coconut Water to hydrate, antioxidant-rich Kiwi Fruit Water to keep your skin looking radiant, and Plant-based Allo-Melanin which mimics the colour of your own skin for a beautiful tan that looks subtle and natural (not a hint of orange in sight!). I found the mousse easy to use and used it in the same way as I would other tanning products; make sure to exfoliate first for the best results. It glided on smoothly and has a tint so you can see if you've missed any areas. As the name suggests, this tan does require around 8-10 hours to properly develop, so apply it an hour or so before going to bed and wake up to a gorgeous tan without the biscuity smell. 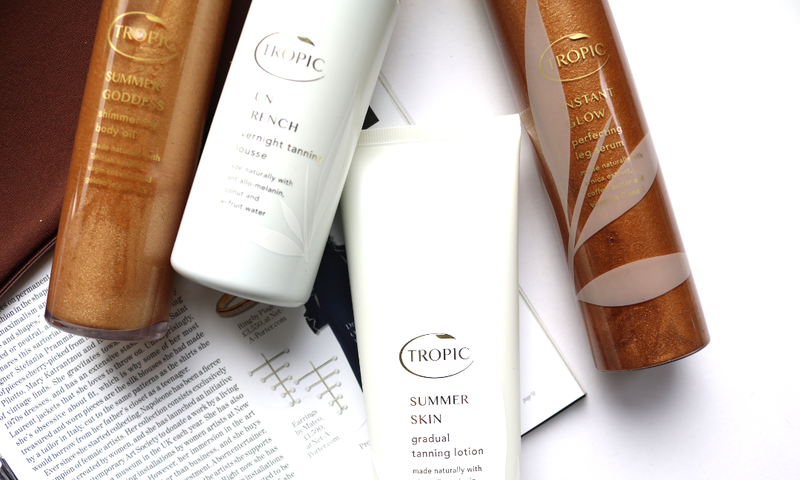 Summer Skin is a fantastic option for those with light-medium skin tones that prefer to get their glow on with a gradual tanner. It feels like a proper moisturising body lotion and contains several skin-nourishing ingredients such as Coconut Oil, Mango Butter and Beetroot Amino Acids to keep your skin hydrated and softer for longer. Being a gradual tanner, the colour does build up slowly to a more natural looking and subtle shade than what you'd achieve with the Tanning Mousse above, so if you're new to tanning or just want a very realistic and even looking hint of colour all over, Summer Skin is a brilliant buy. I've even used this on my face with great results! I'm someone who often feels very self-conscious about getting my legs out in dresses and shorts, so I've found this next product to be a real confidence booster. The Instant Glow Perfecting Leg Serum is another one of Tropic's award-winning bestsellers, and once you try it, it's easy to see why so many people love it. This instant bronzing serum smells incredible and is packed full of natural caramel and gold mica shimmer to give your legs a really beautiful and flawless sunkissed appearance. It goes on easily, doesn't feel sticky and I haven't had any problems with it transferring onto clothes or furniture, though do make sure it's fully absorbed before dressing/sitting etc. The formula is also enriched with Arnica Extract which helps to reduce the appearance of any bruises and scars, and there's Coffee Butter and Vitamin E to tone and rejuvenate the skin. Thanks for sharing.Enjoy your weekend!